"We do get all kinds of requests, but this one was quite perplexing." The local fire department in Ottawa, Canada, got a strange call earlier this week - someone had spotted a dog on the roof of their neighbor's house "We do get all kinds of requests, but this one was quite perplexing," Danielle Cardinal, public information officer for Ottawa Fire Services, told The Dodo. "Everyone was asking, 'How did the dog get there?'" 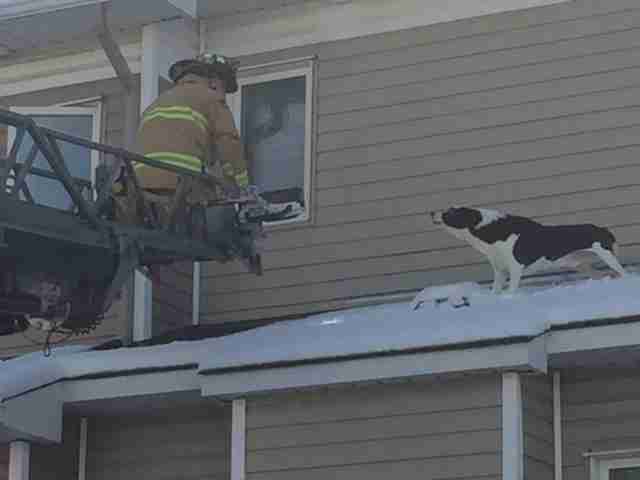 It took seven firefighters who arrived at the scene to figure it out - the dog had gotten onto the roof through an upstairs window. But getting through that window would have been tricky. "It seemed to be a very agile and adventurous dog who pushed his way out of a window by removing the screen and pushing the window open," Cardinal said. "We suspect the locking mechanism may have been malfunctioning on the window that allowed him to push through." The firefighters extended a ladder, and lifted a man to the roof. But when he tried to catch the dog, the dog got scared and backed up toward the window. Luckily, the firefighters had gained access to the house. As the dog moved further toward the window, they grabbed him and pulled him inside. "The firefighters shut the door to that particular bedroom so he wouldn't plan a second escape," Cardinal said. "Then they secured the home and tried to contact the homeowners via Ottawa police." 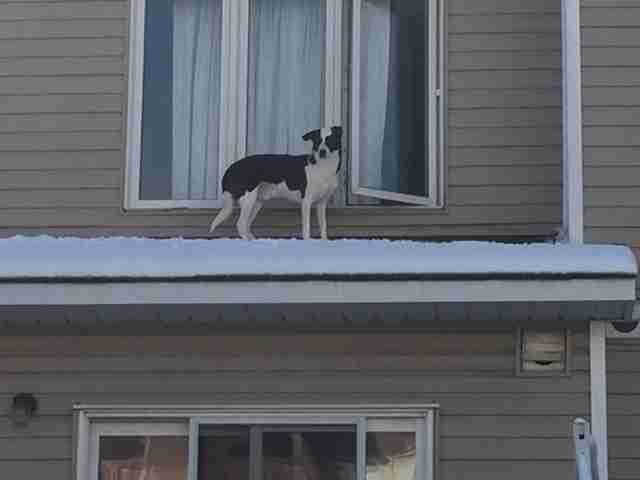 This adventurous pooch isn't the first to venture out on the roof, or at least try to. 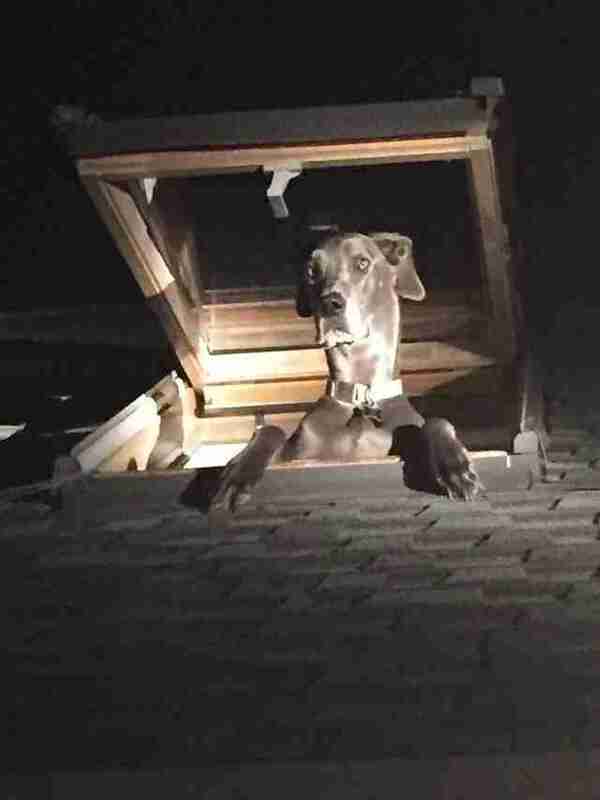 This past October, a Great Dane attempted to clamber onto the roof through a skylight. He made so much noise doing it, his 18-year-old owner (who was inside the house at the time) called 911, thinking a burglar was trying to break in. "I hope my dog never ventures out on the roof!" Cardinal said.